"Creativity and problem solving," Harriete Estel Berman says. The Bay Area artist is getting fired up. "Every school system you'll ever go to, they'll have creativity and problem solving as part of their mission statement. This is what they want to teach their students." But that's not what's happening. Instead, Berman sees what many of us recognize: an increased emphasis on standardized testing, a mandatory one-measurement-fits-all approach to judging students, teachers, and schools that turns classrooms into pressure cookers. That shapes curriculum. That makes the arts - and the creativity and problem solving they teach - seem like a luxury we can't afford. Frustrated by the trend, Berman decided to raise her voice. 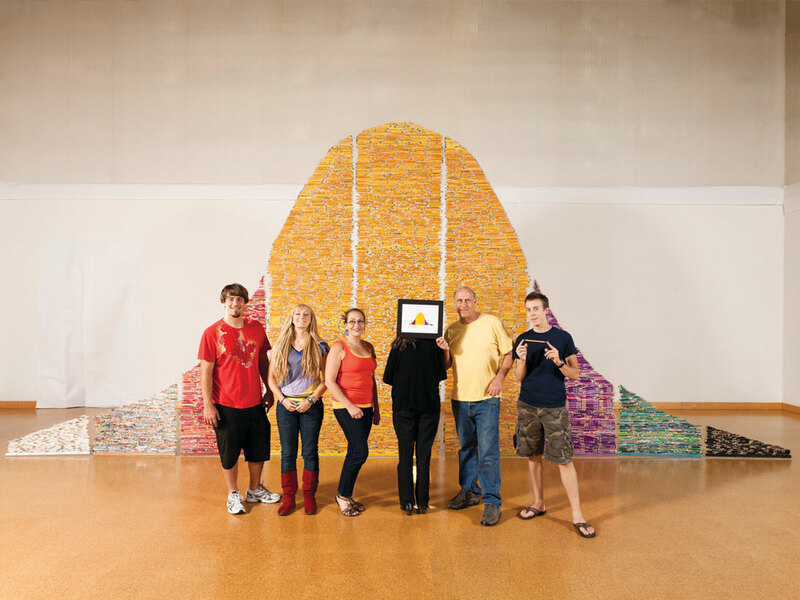 Pick Up Your Pencils, Begin is a 12-foot-tall, 28-foot-wide shimmering curtain of pencils, hanging in the shape of a bell curve - the statistical "normal distribution" used to design standardized tests. Light shines through the gaps between tip and eraser, creating hypnotic, textile-like patterns. The three center stanines - where national norming ensures most children score - swell with thousands of classic yellow No. 2s. To say this work was a labor of love doesn't do it justice; let's call it a labor of enduring, cause-driven devotion. Berman, whose two children attended public school, launched the project in February 2007. She made a flyer explaining her idea and handed it out to educators. She emailed everyone she knew - individually. (The artist dislikes mass email.) Used pencils began pouring in, a couple at a time, then by the envelope, by the box. "I didn't want people to buy me pencils," Berman explains. 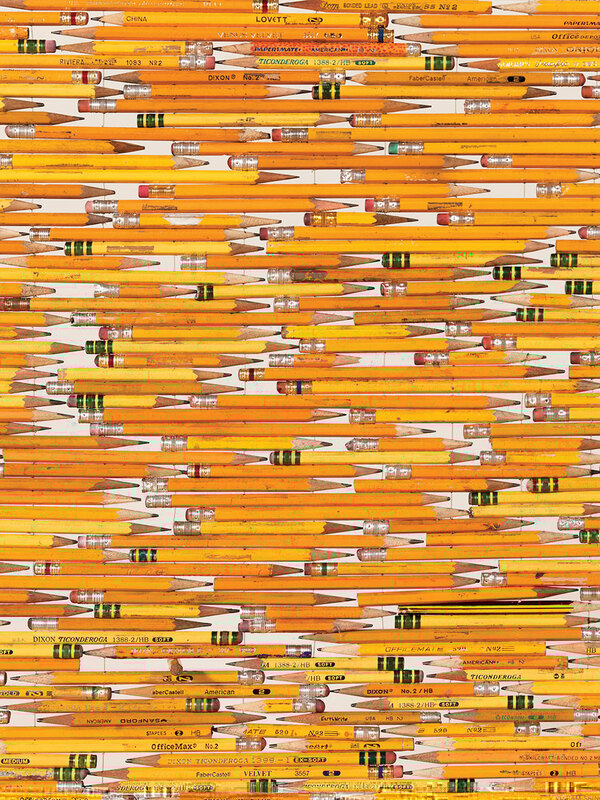 "I wanted people to send me, conceptually, the pencil they took a standardized test with." The artist is no stranger to social issues. In much of her work, she uses trash, emblazoned with colorful brand logos, as she communicates ideas about environment and identity in consumer culture. Grass/'gras/ (2000-01), an inhospitable 9-by-9-foot square of turf made from 32,400 metal blades, rails against the iconic, chemical-dressed American lawn. Measuring Compliance (2006) was her first comment on standardized testing. The classroom vignette is to the point: The desk faces a corner, a strait­jacket binding its chair. Berman is adamant. "It's not just the students who need to be compliant and learn the material in a compliant way, but the teachers who have to comply with the curriculum and the assessments. There's this structure that goes all the way from the top to the bottom of the school system," she says. "It affects everything on a daily basis, and parents know it." Berman, who completed Pencils this past August, began building the first stanine in 2008, threading monofilament fishing line through holes she had drilled in the pencils, in the lobby of a hotel hosting a California arts educators conference where she was a speaker. Over the years, she continued to engage the public, taking the pencils to the 2010 Maker Faire in San Mateo and straight into classrooms. "Students love, love, loved it - totally responded to the pencils just as a visual," she says. It's easy to imagine why. The medium is loaded with associations, many vividly fused to elementary school years: Freshly sharpened pencils lined up in a desk; the No. 2 you need to fill in bubbles on a test; but also the pure, simple learning process - the freedom to make mistakes, erase, and try again. Pick Up Your Pencils, Begin asks us to consider which way we're headed. "Real creativity and problem solving are the future," Berman declares. "New technologies, new ideas - that takes creativity and problem solving." Yet those are concepts and skills not easily taught through increasingly structured, by-the-book curriculum. "What we need to think about is how art can address creativity in the schools and how it can be part of this discussion rather than being dismissed. What can I say? That's why I made the piece." Julie K. Hanus is American Craft's senior editor. Some participants who helped Berman in­stantly grasped the technique. 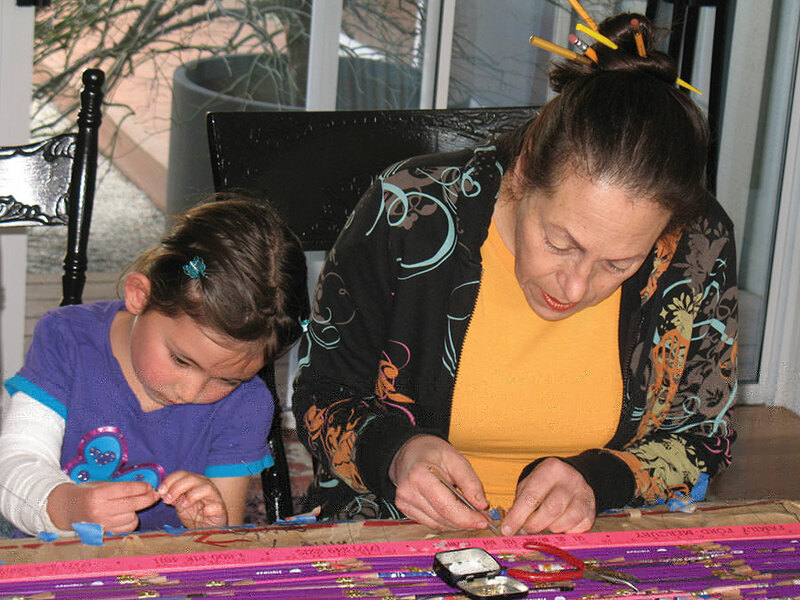 Here the artist works with a young student at her home.